The series was remarkably faithful to the original novel by Alexandre Dumas, with adultery the only major theme to be glossed over. It is memorable for its episodic nature, with an ongoing story and frequent cliffhangers, and for its catchy theme song, which, unusually for children's TV, featured lyrics in praise of drinking beer and fighting. 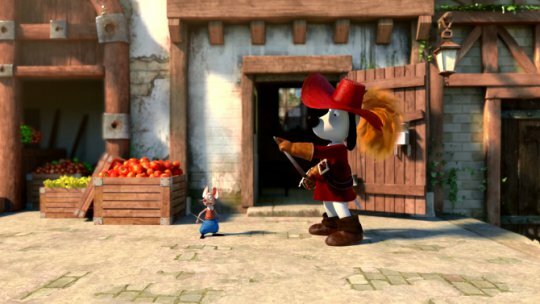 Dogtanian was conceived by Spanish studio BRB Internacional and produced in Japan by Nippon Animation, with prolific voice actor Cam Clarke voicing the brave yet brash protagonist. It first aired in 1981, and was broadcast in European countries including Spain, Portugal, Italy and the UK, as well as in Japan and Mexico. The movie will be produced by BRB and Screen21, working with the Chinese Mili Pictures, and directed by children's author Jose Javier Martinez. BRB Internacional's CEO, Carlos Biern, said the plot would deviate from the series, and the novel, to 'increase the surprise factor', but the production would be loyal to the spirit of the original. Rebooting a beloved childhood cartoon is always a risky business, but the one screenshot released so far appears reassuringly adorable. It is to be hoped that the movie will introduce a new generation to the joys of classic literature as enacted by anthropomorphic dogs in floppy hats. And that, following the example of recent BBC adaptation The Musketeers, Aramis will seize every opportunity to take his shirt off. I preferred Dwight Decker's pun on the Spanish "mouskeperros": Dogtanian and the Three Muttketeers. "Muskehounds"? But yeah, it does sound like it'll be worth watching. And if you haven't read Dumas' original novel yet, do so! It's not anthro, but it's a great read. The Count of Monte Cristo, too. Almost every movie version makes the three musketeers out to be heroes. Dumas' novel says so, but makes it clear that the musketeers and the Cardinal's guards were all just swaggering teenaged bullies showing off their swordsmanship on the average people, with no real difference besides their uniforms. Is there a trailer out for the new version yet? Doesn't look like it - I will be keeping my eyes peeled! Well this is a blast and a half from the past! I don't think it's necessarily quicker and cheaper. I think it gives greater power to studios to control a library of assets and make artists disposable. They'd replace them altogether with computers if they could. I have a feeling that it's gotten harder and harder to make small/mid-budget movies, with shrinking theater business and bloating budgets. It leads them to put all bets on a single $100+ million budget movie with a proven brand instead of making ten $10 million movies that take chances. There's too much saturation of choice and low attention spans to make money that way. Europe still manages to make some 2D animation at lower costs. Of those two, I like the aesthetic of Rex a great deal more, though Dawgtown looks like an interesting story.